The Inter-Insular encounter between the Guernsey and Jersey Table Associations was one of the closest recorded battles in recent times, with the overall aggregate trophy being clinched by Jersey by 1 single match. The host Island’s 56-54 triumph was obtained during the final Green Trophy encounter of the weekend, which Jersey took 8-2, having trailed 54-53 before winning the final 3 matches. Despite losing out in the Green and Aggregate trophy, Guernsey still managed to edge the overall Inter-Insular trophies held by 6 to Jersey’s 5. Quite often in CI sport, there is one Island that is streets ahead of the other in terms of quality and this used to be the case for table tennis too, with Guernsey utterly dominant between the years of 2002 and 2009, the heaviest win coming in 2008 by an astonishing score of 88-22. This was largely due to the extra quality of Guernsey’s Junior players, however Jersey have raised the standards of their Junior players since then and this has resulted in nip and tuck encounters which are up for grabs by both Islands, often decided by the odd 5 set match here and there. This healthy competition can only be good for the health of the Sport in the CI and bodes well for the upcoming Island Games taking place in Jersey in just over 50 days. Jersey may have taken the Green trophy, however it was Guernsey that took the Women’s ‘Margaret’ trophy in equally convincing style courtesy of a 7-3 triumph. Dawn Morgan and Kay Chivers made absolutely no mistakes during the encounter and made up for their Women’s Doubles defeat to Uddnas and Le Maistre the previous evening with unbeaten displays. Each defeated Le Maistre, Uddnas and Kay Lefebvre in singles competition and they combined to clinically set the record straight against Uddnas and Le Maistre in the doubles, a straight game win the order of the day. Chloe Le Tissier struggled to make an impact during the encounter and lost out in straight games in each match. The Over 60’s was another trophy to be taken by the Sarnians and the team of Ian Fitchet, Keith Opie and Maurice James did it the hard way due to reversing a 4-1 deficit to clinch it 6-4. Opie was the star of the show due to his singles wins over David Hole, Malcolm Gallichan and Jersey senator Paul Routier. Fitchet overcame Gallichan once more and Hole, but lost to Routier 3-1. James took his decisive sole win during the final game of the match against Gallichan in style 3-0. The Over 40’s retained their trophy due to a hard fought 5-5 draw. Phil Ogier could not quite replicate his win over Ellis and lost out in 5 games on this occasion. He did though beat Dave Cronin and Terry Boucher, a feat matched by Jez Powell. Ogier and Powell combined to win the pivotal doubles clash against Ellis and Cronin over 5 games. Martin Sarre had a tough day at the office and lost out to all 3 Jersey players in straight games. Despite Jersey retaining the Under 11 Open Singles title, Guernsey should be very proud of the players who were just edged out 6-4, a massive improvement on the heavy 9-1 defeat inflicted last year in Guernsey. Caden Brouard played well during his wins over Noah Risby and Xavier Syvret and he was backed up well by team-mates Ben Sharp and Jack Le Tissier who also contributed to the Guernsey tally. Sharp overcame Syvret in straight games and Le Tissier bounced back superbly from losing to Syvret in 5 with an impressive 4 game win over Risby in 4 games during the final game of the match. Leon Pierre was the decisive factor in the win due to his 3 singles wins and doubles success alongside Risby over Brouard and Le Tissier in 4 games. The Under 15’s was taken 6-4 by Jersey in another closely contested tie. Ryan Bichard led the way for Guernsey with wins over Jacob Gosselin and David Quinn. Matthew Casey added an important 5 game win over Gosselin, but lost in straight games to Quinn. Luke Bichard defeated Quinn 11-9 in the 5th and was involved in the best match of the encounter against Gosselin in the 10th and final game. Gosselin left his best performance to last and his forehand was on fire, particularly during the long topspin rallies from the back of the court. This enabled him to overturn a 2-1 deficit and secure a surprise 3-2 win to clinch it 6-4, the same score as last year. As in the Under 11’s, Jersey had one superior player that made the difference, Luc Miller winning his 3 singles matches and combining with Gosselin to take the doubles over the Bichard brothers in 4 games. Jersey’s strong Under 18 team of Jordan Wykes, Tyler Gosselin and Luke Greenfield ran out 7-3 winners. 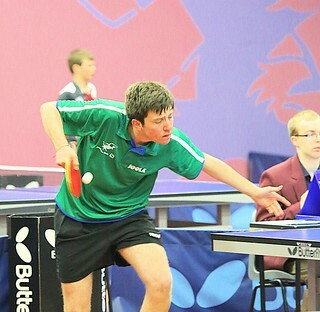 Alex Robinson overcame Gosselin and Greenfield in 4 games but once more lost to Wykes, this time in 4 games. Ben Foss saved his best performance against Gosselin, which he won in 4 games. Ridunian Sol Bower performed well but lost to Gosselin and Greenfield in 4 tight games in each instance. Foss and Bower also lost out in the doubles to Wykes and Gosselin 3-2, despite having led 2-1. The afternoon session saw one of the best Guernsey performances of the day due to the 7-3 win obtained by the impressive Under 13 team. Dan Collenette is a player with big potential and he picked up wins over David Quinn, Alfie Sutherland and Alfie Kelly as well as teaming with Luke Bichard during their 4 game doubles win over Quinn and Kelly. Bichard beat Sutherland and Kelly, but surprisingly lost out to Quinn in 4 games in the opener. Corey Brouard picked up an important 5 game win over Sutherland to extend the margin of victory, but lost in straight games to Quinn and Kelly. Guernsey held onto their Over 50’s title, despite being held to a 5-5 draw by Jersey. Mark Pipet held a 2-0 lead over Eugene Ellis, but this was pegged back by the Jersey player who won in 5. He did win his other 2 singles matches over Bobby Vincent and Tony Wood, a feat mirrored by Phil Hunkin. Pipet and Hunkin combined to edge the crucial doubles clash against Ellis and Vincent in 5 games, having trailed 2-0. Tim Le Page was unable to pick up a win and lost in straight games during each of his matches. The Under 21 Open Singles event resulted in a dominant 9-1 win for Jersey. Lawrence Stacey earned the solitary win over the previously unbeaten Miller in 5 games. The win was well earned as the Guernsey player had trailed 2-1 and also 8-7 in the 5th before coming through 11-9. Jersey made the most of using Green trophy player Chris Moorshead in this event and he won all of his singles matches, as did Tyler Gosselin, the pair then also teaming to win the doubles over Stacey and Robilliard in straight games. Guernsey took the Under 18 Girl’s title 10-0 by default due to Jersey not having a team. Chloe Le Tissier, Charlotte Casey and Daisy Kershaw were the Guernsey players selected. Guernsey went into the Green trophy knowing that a 7-3 defeat would be enough to retain the aggregate trophy, due to winning it last year and ultimately missed out by a single match due to the 8-2 loss. The first 6 games of the match were dominated by Jersey and in particular Wykes, who was responsible for wins in half of those matches. He started with a 5 game win over Joshua Stacey, despite the point of the weekend. The shot came with match tied at 1-1 with the 3rd poised at 8-8. A lengthy rally ensued and Wykes punched the ball down to Stacey’s backhand corner, out of position and away from the table Stacey changed hands and astonishingly retrieved the ball with his left hand. Wykes followed up with a powerful shot down the wide forehand but Stacey managed to get across and a strong forehand topspin secured the incredible point much to the delight of the large Guernsey contingent in attendance. Unfortunately he went on to lose the 3rd 11-9 and eventually the match in 5, 11-3 the score in the final end. Wykes followed up with a straight game win over Joshua Butler in match 5 before teaming with Joshua Band to defeat Butler and Robinson in a straight game doubles win. Debutant Robinson (pictured) had made the perfect start to his Green career due to his convincing display against Band, which he won 3-0. The final end was taken 11-9 on Robinson’s 4th match point, having previously led 10-6. The other match taken by Jersey in the early stages was chopper Chris Moorshead’s epic 5 game win over Butler. Butler was up against the ropes when trailing 2-1 and 6-4 and it was at this stage that captain Jez Powell took a timeout. The timeout worked a treat and within a few minutes and 8 points later, an 11-7 end was clinched by the Sarnian. The 5th end was eventually claimed by the defender 11-7 and Butler will no doubt rue 3 service return errors during the latter stages of it. Robinson was back on court straight after the doubles against Moorshead and he put in a clinical display against the defender. He built up each point superbly with mainly slow paced forehand top-spin balls, concluded with powerful smashes if and when a loose ball was presented to him. This resulted in a straight game win and leaving Guernsey needing just 1 win from the following 3 matches to regain the aggregate trophy. Butler was the first player to attempt to garner the win against Band, but he again found himself up against it when trailing 2-1 and 3-1 in the 4th. Another important timeout was taken at this stage and upon resumption to proceedings, he came back and took it 11-7. The 5th could have gone either way and there were some superb rallies throughout. Band ultimately held the advantage towards the tail end and opened up 2 match points at 10-8. The first was successfully saved by Butler, however Band took it on his 2nd attempt to give Jersey the official Green Trophy win at 6-2 up and also tie the aggregate at 54-54. The continual defensive skills of Moorshead were too much for Stacey in the next match and he came through in straight games, leaving the final match of the 2015 inter-insulars to be contested by the players yet to lose a singles match in the Green, Wykes and Robinson. Wykes was too strong on this occasion and he came through in straight games, much to the delight of the Jersey supporters and players in attendance. Guernsey can look back on a variety of mitigating factors in the narrow defeat and be proud of the performances put in by all players away from home soil and can now focus fully on ensuring that a golden games is the order of the day in Jersey 2015 for the bi-annual Island Games.